This week we are travelling overseas, and if you've read our blog before, you may be aware that my son is a very picky eater. 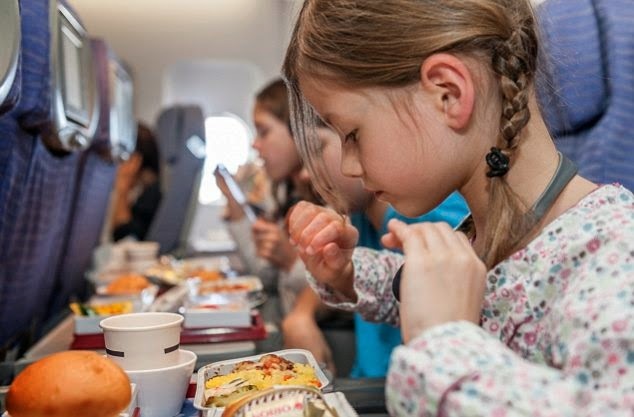 So in preparation for three separate flights, with meals spaced far apart and containing some (in his eyes) questionable food options I decided to put together a list of 10 great travel snacks for kids. These are specifically chosen to be taken on board planes (which have their own set of rules and conditions) but can of course be used for any type of travel. Some general rules for aviation are: bring foods that can last a long time without refrigeration, and bring foods that aren't too messy. Cereal - Low-sugar, high-fiber cereal can be eaten on its own, or made into a trail mix. If your cereal happens to be ring shaped, make a necklace by threading cereal onto a piece of yarn of appropriate length and tie around your child's neck. Great snack on the go during moments when you can't get to your packed snacks for a bit. Granola Bars - Make your own or get store bought low-sugar, high-fiber bars, whichever fits your schedule. Mini pancakes - A few days ahead of your trip, cook a batch of mini pancakes (easier for smaller hands to hold). On the day of travel, pack the frozen pancakes in a resealable bag or airtight container. The pancakes will thaw out as you get started and will be unthawed by snack time. Whole Wheat Rollups - Check out some of our great rollup ideas here. 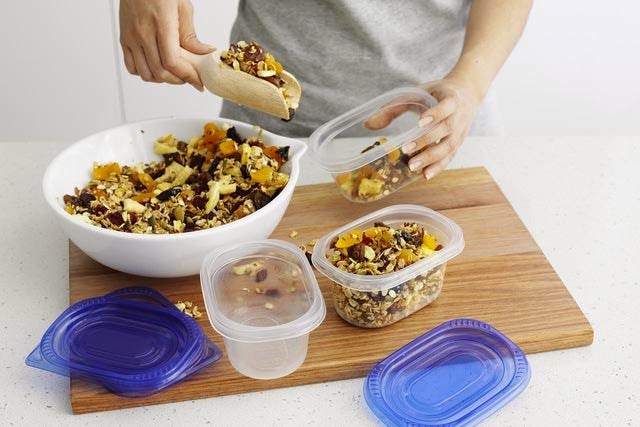 Depending on your type and length of travel you can cut up into pieces and pack in an airtight container, or leave them rolled up to be eaten whole. Just keep in mind to keep cold if using meats and if flying stick to ingredients okay in room temperature. Dried fruit - A better alternative to candy, but still loaded with sugar and when you're little one is strapped in their seat (or on your lap!) for eight hours straight, we want to go lightly on the sweet stuff. Cheese - Stick to the pre-packed stuff for ease and portability. String cheese or Babybels are good and will even keep your child occupied peeling/eating for a while. Fruit & Crackers - Choose your fruit and crackers wisely, pick bitesize fruits like grapes rather than mushy ones like bananas. Likewise choose crackers like Goldfish rather than the crumbly ones. Popcorn - Pop some popcorn and pre-pack in smaller, resealable bags. Mini Bagels - Can be enjoyed as is, or prepared in advance with cream cheese or nut butter. Treats - Sometimes, a situation will call for a very special treat that your child doesn't necessarily get very often (like when your plane is stuck on the tarmac for an hour or two before taking off). Something that takes their mind off of the situation at hand. This could be twizzlers, mini marshmallows, gummy bears, bitesized mini cookies or any other treat you know will tide your child over. Keep in mind that although most of the time, nuts are allowed on planes, sometimes you will be asked not to eat them due to someone with allergies on board. So if you choose some of the nut choices, make sure you have several other snacks with you to eat, should you be asked to leave the nut ones packed. 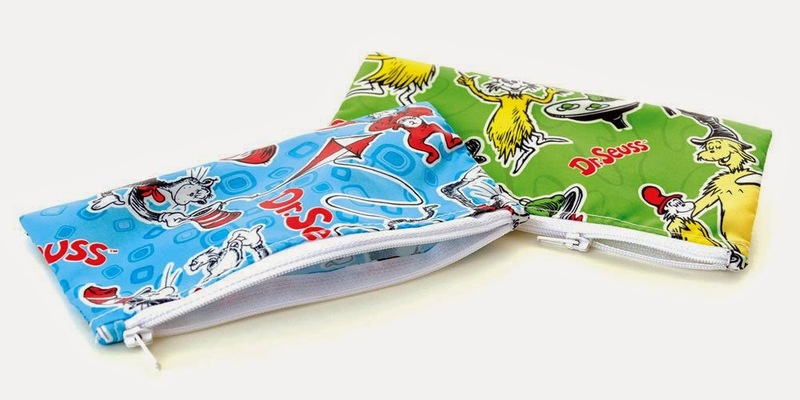 Bumkins reusable snack bags are great for packing snacks without leaving a trail of garbage. 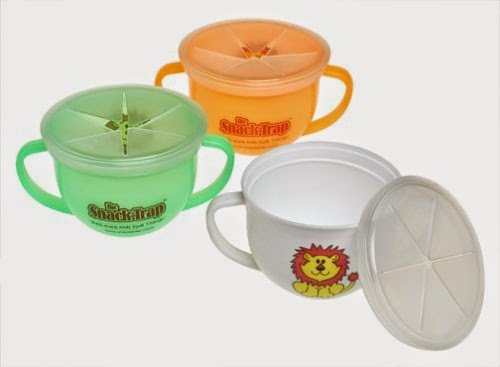 Snack Trap is a great container that allows your child to help themselves to their snack, without the risk of spilling, thanks to the snack lid!